Everyone loves a beautiful scenic photograph. Catch the light just right and it can be magical. Sometimes, however, our goal as photographers is to tell a more complete story with our photos. Not every photo we take is destined for a custom frame in the lobby of the local bank. Sometimes we just want to document our lives. We do this by providing our photos with "context." There are probably as many ways to show context in a photo as there are photographers. Portrait photographers do it by shooting on-location. Wedding photographers don't shoot a portrait of the bride wearing half her makeup; they shoot into the mirror while she's applying the makeup. Context helps to make a photo make sense. 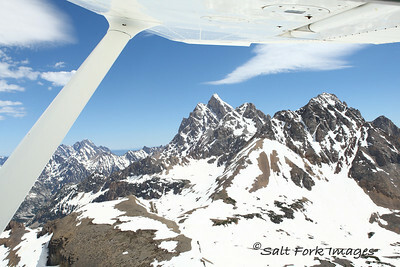 During the summer of 2010 I took a scenic airplane flight around Teton Valley, Idaho. We took off from the Driggs airport and headed southwest toward Pine Creek Pass. As we climbed through 10,000 feet with the Big Hole Mountains on our right, our pilot gradually turned to the east. We continued to climb above the Snake River Range and then made the big sweeping turn back to the north. This took us directly over the western foothills of the Tetons just barely inside the western edge of Wyoming. Grand Teton tops out at 13,770 feet but our flight never got over about 12,500. That means that we were staring at The Grand (and Middle, South, Owen, and Teewinot) straight out the window. As we approached the big peaks my pilot announced over the intercom that he would be glad to tilt the little plane whichever way I wanted so that I could get some good shots of the mountains. I thanked him and when the time came he pulled the right wing up a little so I could get the unobstructed view he thought I wanted. I snapped a few shots and was generally pleased with them but as he leveled the plane and I backed out on the zoom lens, I noticed how much more I liked the shots that showed the airplane wing and the wingstrut. The photo below is an example of the kind of context that tells a story. When I look back at the photo above, I think, "Wow, I love those mountains!," and "This airplane thing is cool..... I've got to GET ME ONE!"